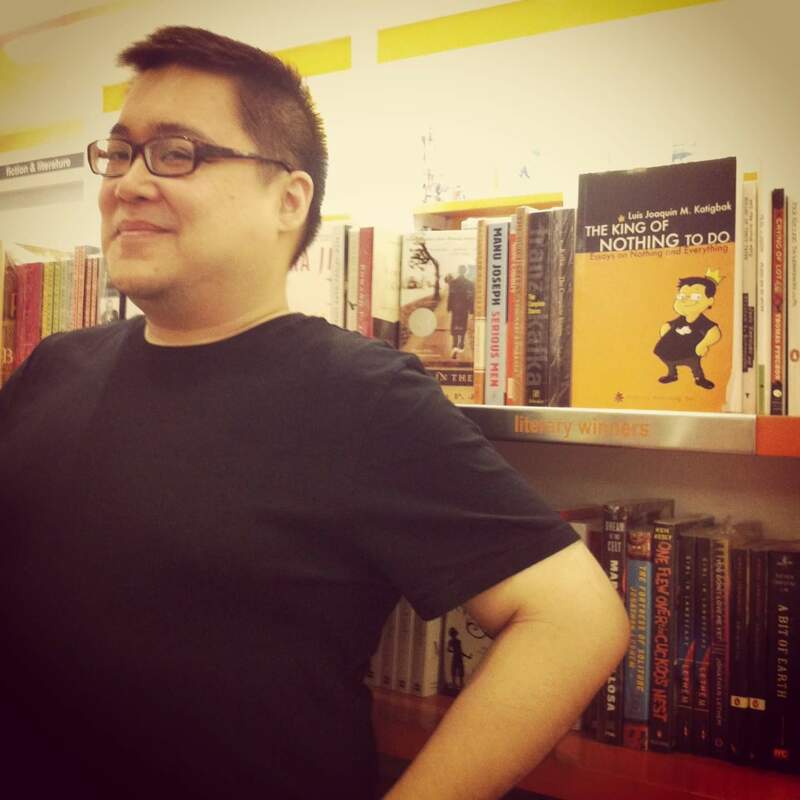 I first met Luis Katigbak as a freshman at DLSU, when I sat down for a guest lecture on fiction and writing. I had no idea then that I’d eventually come to know him not only as a bibliophile, geek, and an ardent lover of music, but a friend who is all too happy to share his brand of enthusiasm to anyone he happens to meet. Where most people know him for his work and contributions to the writing circles of this country, he’s always been my Jiminy Cricket — a steady voice of encouragement and support; keen to enable what I like to call “Little Big Adventures”. He’s the generous soul who took the time to accompany me as I checked out studios in Quezon City, who made me laugh even as I quaked in my boots. When he wrote about that experience for the Manila Bulletin, it wasn’t something I expected, that’s pretty much the kind of guy Luis is. He’s sees the promise of talent in others and doesn’t shrink from letting them know it, or hold back in telling them that they ought to share what they have to share. A few years ago, I had the opportunity to work with Luis for a piece featured in UNO Magazine’s April 2010 speculative fic issue. He knew that text-based roleplay was one of my most prominent hobbies, having picked my brain about it several times in the past, so his pitch for us working together was the best kind of awesome and sneaky. On paper, I was to transcribe lyrics from since-lost recordings of a girl named Kay Ventura — Luis’ Lost Rock Goddess from an era of OPM that’s come and gone. During the writing process though, I got to be her. I crafted out the lyrics, bearing in mind the kind of musician Ms. Ventura was supposed to be, and the kind of stories she felt compelled to tell through her songs. It’s ridiculous fun, getting into the headspace of someone like that. I was thrilled to see the piece in it’s full and published form, and I continue to feel very, very honored that I had been a part of that. “More Than I Ever Wanted Anything” by Luis Katigbak, from UNO Magazine’s April 2010 Speculative Fiction issue. It was shortly after New Year when I got wind of news that Luis wasn’t doing too good. I got in touch with individuals who I knew would be more apprised with how he was doing and learned that a benefit concert was in the works. That said, I would like to invite you to all to Subterrania Sessions, a benefit gig put together in an effort to help Luis, who is currently in critical condition due to complications arising from diabetes. The show is scheduled for this coming 31st January, 9PM at Route 196 Katipunan Extension. 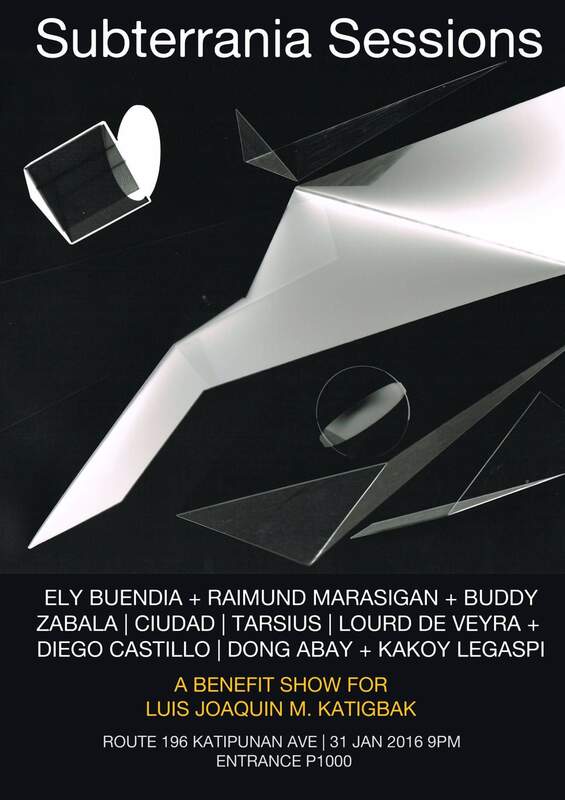 The artist lineup that includes Ely Buendia, Raimund Marasigan, Buddy Zabala, Lourd de Veyra + Diego Castillo, Ciudad, and Tarsius. For those of you still riding the high of Honor Thy Father, it might also interest you to know that Dong Abay and Kakoy Legaspi will also be performing their contributions to the film’s score, live to audiences for the first time. Proceeds of the benefit gig will be donated to assist Luis and his family with their medical bills, so if you’re looking for a fun Sunday evening of music and artisty, I very much encourage you to drop by.